This curry is always a crowd pleaser. The talented Skye Gyngell, of Petersham Nurseries fame, does the decadent lobster version in her book ‘A Year in My Kitchen’ and I have tweaked her recipe slightly to suit my style of cooking, but the essence of this recipe stems from Skye, I sadly take no credit. 1. Blending the onions after they have been cooked on a low heat. I found that I preferred a slightly smoother texture, but not blending them works equally well. It’s just a personal choice. 2. I have only used one 400g can of coconut milk. I find that it is more than sufficient. 3. I use a little less sugar. 4. I have omitted the toasted coconut flakes to serve – mainly because my husband finds it a bit of a coconut overkill, but again this is down to personal choice. 5. Skye uses a whole tamarind pods and breaks off a little piece as she needs them. She soaks these pieces in hot water for 20 minutes. In the photo above I put 1 tablespoon of caster sugar as Skye suggested, however, with hindsight, I would reduce this amount but half. Add a little, then taste it to see if it needs any extra sweetness. 1. Break a small piece of tamarind (the blocks that you can buy NOT the paste) into a bowl and cover with boiling water. Leave to stand for 15 minutes. Following this strain the liquid into another bowl. Really press the pulp into your strainer with the back of a spoon and then put the extra strained pulp into the water. Tamarind has a wonderful sour taste,which adds real depth and balance to a dish. I absolutely adore it. 2. Cut the monkfish into 2 inch pieces, or larger if you prefer, and clean under cold water. Set aside. 3. Heat a small frying pan and when it is hot, gentle toast the coriander seeds for 30 seconds so they begin to brown, then set aside. 4. Heat a little olive or vegetable oil in a pan over a medium heat. Add the onions and cook until they become translucent. This will take around 5 minutes. 5. Put the ginger, garlic, chillies, toasted coriander seeds and tomatoes in a blender and whizz to a paste. Then place the translucent onions into the paste and whizz again briefly. Transfer the contents back into the pan and simmer for 5 minutes, stirring frequently. If you prefer it less smooth then obviously do not blend the onions. 6. 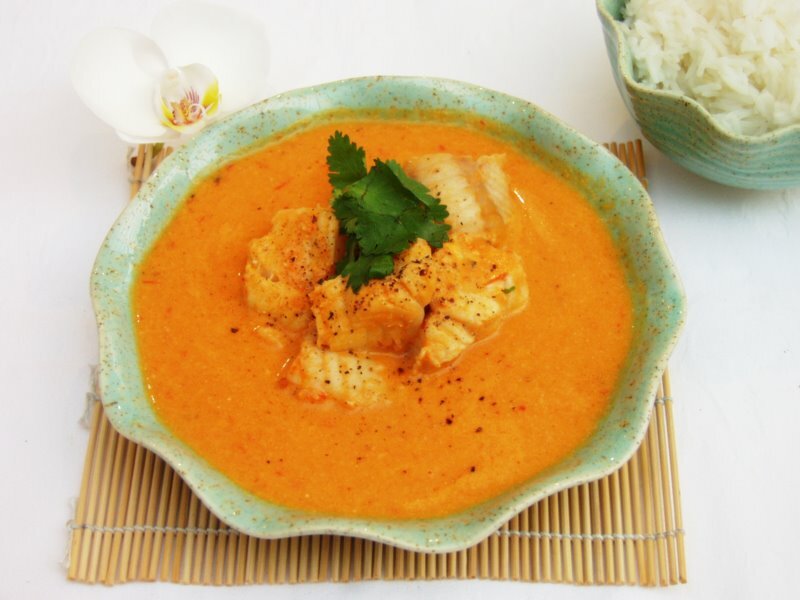 Add the sugar, fish sauce, tamarind water and coconut milk and stir so that the contents are merged into the tomato and onion sauce. Simmer for a further 5-10 minutes. 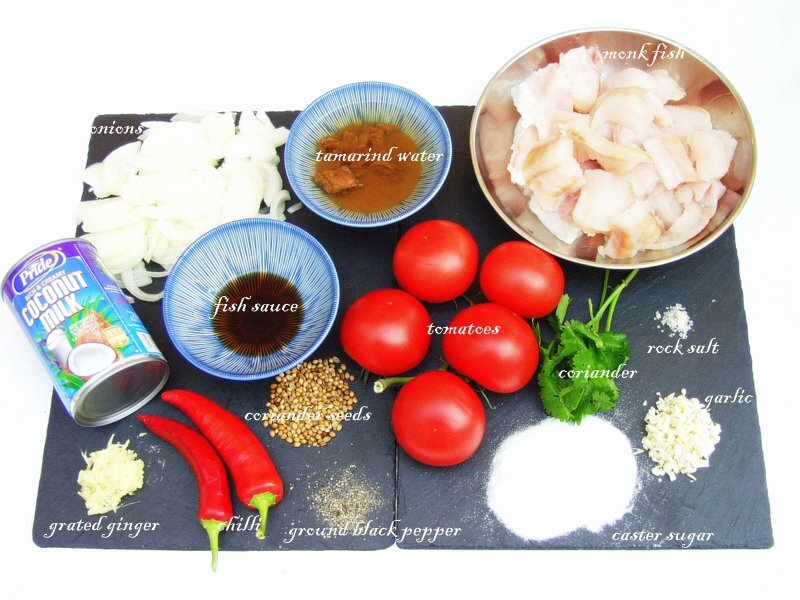 Add the monkfish and add additional seasoning if it requires it. Keep the heat on medium/low heat stirring occasionally for no more than 10 minutes. Be careful not to break up the monkfish! 7. Ladle into a warm bowl or soup plate and garnish with coriander leaves or coconut flakes. Serve with a bowl of steamed rice. This entry was posted in Fish and tagged coconut, coriander seeds, fresh coriander, ginger, monkfish, new york times, Petersham nurseries, sam sifton, skye gyngell, tamarind, toasted coconut flakes. Bookmark the permalink.